The regional divisions of the Europe central regions, part of the Western Europe super-region. The Central European regions are part of the Western Europe super-region. The area serves as a fertile ground where a different kind of battle takes place, one where lives and concessions are not decided by hard swords, but by soft-spoken words. The battle for diplomatic supremacy in the HRE politics have been ensuing for the past millennia; has the time come for the final victor to arise? The would-be emperors who manage to enact all of the reforms can stand atop one of the richest and strongest nations in the world, which was once known at the peak of its glory as the Holy Roman Empire. On their long journey those future emperors will find themselves clashing with rival nations who hold end goals of their own. Some would rather leave the image of the old empire in the dusts of the past where it belongs. Instead, they would rather carve the heart and core of the empire out; to transform and rebuild it into its modern-day counterpart, under the flag of the mighty Germany. Others, down in the southern parts of the old empire, would instead see the last of the chains shattered as the plot to sever their ties to the political entity finally comes to fruition. Now, free to forge their own destiny, they avert their eyes to the south - to the lands ruled (for now) by their Latin brethren. Relying on the newly arrived riches of the world at their ports, the forces are amassed little by little. Unbeknownst to them there are other forces at play. Those same Latin brethren also took note of the broken chains. Encouraged by the lack of imperial retaliation, plans are being made to grab the riches from their - once imperial - kin. Amongst them all are the men of clergy, servants of God on earth. Felling the power void they seek to fill it with highest authority of all, God himself. The time has come for his kingdom on earth to rise. Each faction, each member, stands ready to be the first to give the march orders and to crown themselves at the end as the rightful ruler of the region; but will it be under the secular banner of Italy or under the sacred banner of The Papal State? Up in the north the descendants of the Vikings await. Although tamed with time their blood still longs for the glory that is only gained in battle; the golden hair now dirtied from mud and soaked red by blood. The lords of the white snow are build new foundations to strengthen the alliances and direct the people to the old southern empire. United outwards, but divided within. Each coveting to be the one among many, the first among firsts, ruler of the unified Scandinavia. Amidst all of this, a religious turmoil sweeps the land. The Christian world is about to splinter yet again as the desire for reform and change grows stronger. Once brothers sharing one set of beliefs, the nations are picking the splinter religion most serving their goals and in the process setting the stage for decades of religious strife and wars. Which nations will become the core of the next empires? Which religion will come on top in the religious wars? Only the player and the coming centuries can tell. Feudal Monarchy is the dominant government type. Theocracy government forms are much more widespread here than in other places (notable mention is the Papal State's Papacy). 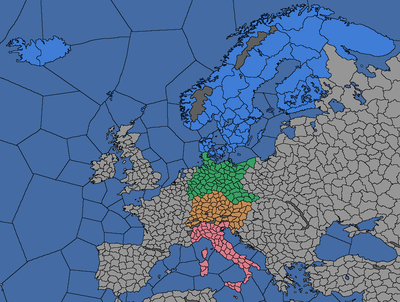 Republics take the form of Free Cities in the HRE (these nations can only be OPMs) along with other forms in northern parts of Italy and Germany ( Milan also has the option to get the unique Ambrosian Republic). Catholic is the only religion in these parts at the 1444 start (also, the province of Roma serves as the holy city for the catholic world). As reform desire reaches its peak in the Christian world, the Protestant and Reformed denominations will start to spread across the continent (especially in the north). All nations in these parts belong to the Western technology group. Nordic in the northern part. Germanic and West Slavic in the central and eastern parts respectively. Latin in the southern part. In the following tables, countries whose culture is in bold are the primary country for that culture; they will never lose their cores on provinces of their culture. These nations don't exist and also lack cores at the 1444 campaign start. They can still appear if Separatist rebels manage to take control of their cultural provinces. In (parentheses) are the dates they can be first played in, if possible. For countries in the Latin culture group with their capital in Italy (region). Notes: This region holds provinces necessary for forming Italy, Sardinia-Piedmont and Tuscany. The province of Roma (118) is of religious benefit for Christian and Muslim nations (except Catholic nations). While The Papal State can't form Italy like the rest of the Latin nations, it can still get a claim on the region through enacting the Kingdom of God decision. For countries in the Germanic culture group. Notes: This region holds provinces necessary for forming Germany, Hannover and Westphalia. All the nations in this region are also part of the HRE. Notes: This region holds provinces necessary for forming Scandinavia. Notes: This region holds provinces necessary for forming Germany. All the nations in this region are also part of the HRE. This page was last edited on 10 March 2019, at 11:36.